A favorite of new dads everywhere! 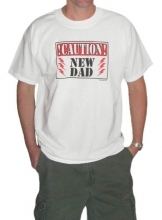 Our Caution New Dad is a great gift for the dad-to-be, whether he's a first time New Dad or a sixth time. This shirt is a great way to proudly announce the arrival of your little one (and helps explain the dazed and sleep-deprived look that many new dads experience during the first few weeks).